There’s no better feeling than escaping the daily grind; the wind in your hair, not a care on your mind. But travel is not all rest and relaxation! On the contrary, heading to new and distant regions can throw you any number of curveballs. There’s no denying that a year out of your ‘normal’ life can be somewhat daunting as you wave goodbye to your daily routine and let go of everything familiar. However, a gap year can have huge benefits for recent school or university leavers or those wanting a mid-career sabbatical. Apart from experiencing a different culture, you may also pick up a new language or life skills, discover a hidden passion or even boost your career prospects. The dry winter season runs from May to September which is when the famous waves of Uluwatu, Padang Padang and Impossibles break at their best due to the South East trade winds. The wet summer season from December to March usually translates to fewer crowds and smaller waves. On the other hand, the east coast waves, on Keramas beach for instance, really come into play at this time of year. If you’re interested in an animal conservation project, you’re in luck. There are a huge number of conservation projects around the world looking for volunteers just like you! From jaguar conservation in Costa Rica, marine work in Fiji to volunteering with sea turtles in Greece, there’s no limit to the sheer variety of projects on offer across the globe. If you dream of traveling the world but don’t have the budget- never fear, a working holiday could be the answer for you! Working abroad can give you a real insight into the local culture and allow you to truly ‘experience’ your environment. Popular gap year jobs include au pairing, teaching English as a foreign language, cooking and household help or seasonal work such as fruit picking or farm work. Touched on above, teaching English as a foreign language (TEFL) can be a rich and rewarding experience. For those considering teaching as a career, TEFL can be a great way to dip your toes in while funding your travels. TEFL programs in third world regions can be a particularly altruistic pursuit as just a few words of English can be greatly beneficial to those living in impoverished areas. You may decide to take a year off to simply explore the world. After all, when will you get the chance to simply live each day as it comes, deciding to take on a new destination on a whim? Regardless of where you backpack, take the time to consider where you'd like to go, as you can always go 'off the grid' once you've settled into your groove. Are you the sporty type? An athletic adventure abroad could be right up your alley! There are loads of opportunities all over the world for those who want to participate in a sports project. Whether you teach football to children in South Africa, become a ski instructor in the french alps, play a cricket season in Australia or learn how to sail and dive in Thailand, the possibilities are endless! Planning and preparation is key to the success of your gap year getaway. Whilst discovering new destinations and making magical memories should be a priority, it's a good idea to pack the sensible stuff along for the ride too. If you've never travelled overseas organising you trip can be a daunting task. Keep reading for some top tips on budgeting and apps you just shouldn't leave behind! It's no secret that backpackers are usually travelling on a shoe string budget. When going overseas for such long periods it's important to work out how much money you're going to need and how long it is likely to last. Of course, this vastly depends on where you are travelling to and what you plan to do when you get there. If you’re travelling to Asia, you may be able to survive on as little as $30 a day, whereas somewhere like the USA could be more like $80. When planning your trip be sure to read up on your destinations typical accommodation and food costs, and price of planned experiences to understand what you might be forking out. Travel with friends: Make sure you communicate with your travel buddies about budgets before you go. If you’re travelling on a shoestring while your buddy’s planning a budget blowout, chances are you’ll find yourself doing more squabbling than sightseeing. Pick a travelling companion with a similar budget in mind or make sure you compromise evenly on your activities. Time to start saving: You’re going away for a while, it times to rein in the extravagant splurging and start to save the pennies. All your friends may be going to see Justin Bieber, and you’ve got a serious case of #fomo but think of all the stories and adventures you’ll have on your gap year. When you’re saving for your big trip you’re going to have to say no to expensive activities in the lead up. Get a second job: A few extra shifts or a temp role can be the key to getting you that little bit closer to your holiday-fund goals. Whether its watering your neighbour’s plants, babysitting for the family next door or pulling pints down your local -every penny helps. Holiday spending: Once you’ve scrimped and saved, it’s time to decide the best way to splash your hard-earned cash. Travel cards are a good option as you get to lock in the exchange rate before you go. Although, make sure you have enough money on the card in each currency because if you run out of one, it will take from whatever is left. Travel cards are also great for security as they are not linked to any of your other accounts. If you prefer cash you can get foreign currency from a bank or currency exchange before you go, or use ATM’s once you land. You have little risk of being ripped off using an ATM and it allows you to keep track of your account balance. Ideally you don’t want to be traveling with huge amounts of money in your pockets for safety reasons. A safer way to deal with this is by using travellers cheques, a good back up option if you're heading somewhere remote without ATMs. These days there seems to be an app for just about everything. Whether you need to book your accommodation, meet-up with travel buddies, share snap chats, or translate the local lingo there is no end to the tools and apps available to the modern traveller. Google Translate: If you’re visiting more than five countries, we wouldn’t blame you for being a little dusty on the local lingo. Luckily Google Translate is there to save the day at all those awkward encounters. Whether you need directions, want to translate a menu or are trying to book accommodation, the Google Translate app for Android and iOS supports more than 90 languages and can translate 37 languages via photo, 32 via voice in "conversation mode", and 27 via real-time video in "augmented reality mode". How’s that for convenience. XE: The go-to site for currency conversions on the web. Very handy when you’re visiting multiple countries. When backpacking, it’s usually the case that you’ve just got your head around one denomination when it’s time to learn the next. Download XE to help with all those curly currencies. Timeout: If you’re city-hopping the Time Out app is a great directory of ideas of things to do. With coverage from Accra to Amsterdam, Edinburgh to Singapore, the app covers everything from bars, restaurants, attractions and events. The event finder is a particularly cool, meaning you’ll never struggle to find the most popular concerts, festivals or one-off happenings going on around you. Google Maps: Yet another Google product, Maps is widely-regarded as one of the best navigation apps around. Whether you’re in Taiwan or Timbuktu you’ll find it fairly reliable in offering up local public transportation options. Don’t forget and you can also download specific areas for offline use. Whether you’re going it alone, or backpacking with buddies, it’s important to get prepared and have a few safety tips up your sleeve. Whether you’re planning an action-packed gap year, an exploration into the depths of East Asia, or even a humanitarian aid role in a Central American disaster zone, you will need to head to a clinic to get a variety of jabs before setting off. Whilst vaccinations may not be your favourite pastime, you simply can't leave without them. The risk of contracting a tropical disease can depend entirely on those shots. Ideally, you should get your vaccinations about six to eight weeks before you’re due to travel. This gives your body time to acclimatise to the vaccine before your travels. Your governments travel advice website should be site to visit for all up-to-date travel advice. These sites give you updates on the safety and political events in every country, as well as general travel advice. Make sure you constantly keep up to date with the local news of the area you are travelling to so you know where the risky areas are. If there has been reports of disruptive behaviour, don’t go there. The safetravel.govt.nz is the official travel advice site for Kiwi’s covering all destinations. Whether you’re travelling overseas to visit family, as a tourist, for business, or to live, the Safe Travel encourages you to register your plans before you leave New Zealand. It's a good idea to make copies of important travel documents such as passport, credit cards (front and back). Leave a copy with the person you trust the most back home and take a copy with you in your backpack should your originals get lost or stolen. Write down important phone numbers such as your travel insurance emergency assistance line and embassy contacts for each of your destinations. You are in an unfamiliar country and you don’t speak the local lingo. Who knows what lies around the corner that may have an unexpected cost!? Make sure you have an emergency fund, or access to a credit card set aside for emergency situations. Even if you have a good travel insurance policy that covers theft of cash, you might not be able to get the money straight away. Make sure you can pay for expenses out of your own pocket. If you're staying for a long time in one country, buy a local sim card and put it in your existing phone (get it "unlocked" before you go away). If you're travelling in several countries, a global sim card is better. If you decide to use your regular mobile, ensure that it has international roaming switched on so that you can reach your loved ones in case of an emergency. Remember that international calling can be very expensive, so no long calls home to mum via this method if you’re feeling home sick! There’s no better feeling than escaping the daily grind; the wind in your hair, not a care on your mind. But travel is not all rest and relaxation! On the contrary, heading to new and distant regions can throw you any number of curveballs. Whether you’ve taken a spill on the sidewalk, been mugged in a market or picked up an exotic disease, a travel insurance policy for your gap year will pick up the pieces. Just as you might compare flight prices, you can compare insurance policies too. Travel insurance policies vary in price and benefits. A comparison website is an easy way to digest all the information in one place. A working holiday visa is a residence permit allowing travellers to undertake employment (and sometimes study) in the country issuing the visa to supplement their travel funds. For many young people, holding a working holiday visa enables them to experience living in a foreign country without undergoing the usual costly expenses of finding work sponsorship in advance or going on expensive university exchange programmes. Most working holiday visas are offered under reciprocal agreements between certain countries to encourage travel and cultural exchange between their citizens. Australia: Duration: 12 months (but no more than 6 months working for one employer). Age Limit: 18- 30 years. Countries Accepted: Taiwan, Estonia, Belgium, Italy, France, Cyprus, Finland, Hong Kong, Norway, Sweden, Denmark, Germany, Malta, Republic of Korea, Ireland, Japan, The Netherlands, Canada, United Kingdom. Passport holders from Turkey, Thailand, Malaysia, Iran, Indonesia, Chile, Bangladesh, Argentina and the USA need to apply for a subclass 462 visa and are required to have a tertiary education. Canada: Duration: 12 months. Age Limit: 18- 30 years for most countries, 18- 35 years for Switzerland, Ireland, Italy, Germany, France, Denmark, Czech Republic and Chile. Countries Accepted: United Kingdom, Taiwan, Switzerland, Sweden, Norway, New Zealand, The Netherlands, Latvia, Republic of Korea, Japan, Italy, Ireland, Hong Kong, Germany, France, Estonia, Denmark, Czech Republic, Chile, Belgium, Austria, Poland, Ukraine and Australia. New Zealand: Duration: 12 Months. Age Limit: 18 – 30 years (18-35 in some cases). Countries Accepted: Argentina, Belgium, Brazil, Canada, Chile, China, Czech Republic, Denmark, Estonia, Finland, France, Germany, Hong Kong Special Administrative Region, Ireland, Israel, Italy, Japan, Korea, Latvia, Malaysia, Malta, Mexico, Netherlands, Norway, Peru, Poland, Singapore, Slovenia, Spain, Sweden, Taiwan, Thailand, Turkey, United Kingdom, United States of America, and Uruguay. Note: Visa information is likely to change over time. Please refer to your specific governments website for up-to-date, accurate visa information. Fancy some philanthropy? Whether you yearn to work with turtles or help build a school, we've got some inspirational ideas to get your generous juices flowing. Discover historic Greece when you live and volunteer alongside a team of international volunteers, and make a real contribution to the conservation and protection of one of the most important loggerhead turtle nesting areas in the region. Based in the beautiful Bay of Lakonikos in the southern Peloponnese, you will get to do hands-on work with one of the most endangered species in the Mediterranean. Get to see turtles lay their eggs and watch hatchlings head for the sea and experience Greek culture first hand. Learn more. Dive in crystal blue water and discover the rich biodiversity of the South Pacific while assisting with research which will aid the local management of marine protected areas. While living on the stunning Caqalai Island, you will get to travel to idyllic traditional Fijian villages; gain your PADI Advanced Open Water qualification and contribute towards tangible, long-term community benefits. Learn more. While rich in culture, history and geographical wonders, Nepal is still one of the world’s poorest countries in the world and suffers from many of the issues associated with poverty, such as malnourishment, a lack of resources. When you volunteer you can help out at special needs centres for malnutrition and HIV/AIDS, day care centres and early learning classes. Whichever volunteer care project you find yourself working on, your efforts will help to support local staff and support some of the most vulnerable groups in Nepalese society. It’s a challenge, but a rewarding one! Learn more. Travel to beautiful city of Luang Prabang, a UNESCO World Heritage Site, and contribute to sustainable women’s empowerment initiatives in the local community. Teach English lessons and life-skills workshops and play a significant role in increasing disadvantaged females’ access to education, while improving their employment opportunities and quality of life. Learn more. Imagine teaching English or French to children in a stunning country like Morocco, with it's Arabic culture that is totally different to what you're used to - you'll help the children and they'll give you a North African experience that you'll never forget! The project is based in the city of Errachidia, which is situated in the ZIZ valley, in between the mountains of High Atlas and the dessert sand hills in South West Morocco. Learn more. For more than 20 years CIWY has been working for the benefit of wildlife rescued from illegal trafficking, giving disadvantaged youth a sense of purpose through involvement with wildlife care, and educating the Bolivian public to respect wildlife. The Comunidad Inti Wara Yassi is a legally established Bolivian organisation, made up of a team of young professionals and Bolivian volunteers, as well as international volunteers from all over the world. Volunteering at one of their wildlife centres is hard work. However it is also incredibly rewarding, unique and sure to be a memorable experience. Learn more. Some of the most important work that needs to be done in developing communities is the construction of basic infrastructure. Building projects really allow volunteers to be immersed in the local community. Volunteers stay with a host family and work with community members and organisations to ensure that projects are completed and match the needs of the people they’re benefiting. There are a vast range of community building and development projects, available in Ghana, Jamaica, South Africa, Nepal & more. Learn more. Regardless of whether you travel regularly or are planning the gap year trip of a life time, the unexpected may happen and being on the end of exposed risk could see your holiday end in financial ruin. 1. It could happen to you! 2. Overseas medical expenses are expensive! Falling ill or being injured while travelling can be very unpleasant, stressful and costly. Covering the cost of medical treatment if you become ill or have an accident abroad is prohibitive for many Kiwis. Did you know? Daily hospitalisation costs in Southeast Asia regularly exceed $800. Medical evacuation costs from Bali have exceeded $60,000. And returns of remains from Europe have cost in excess of $10,000!! 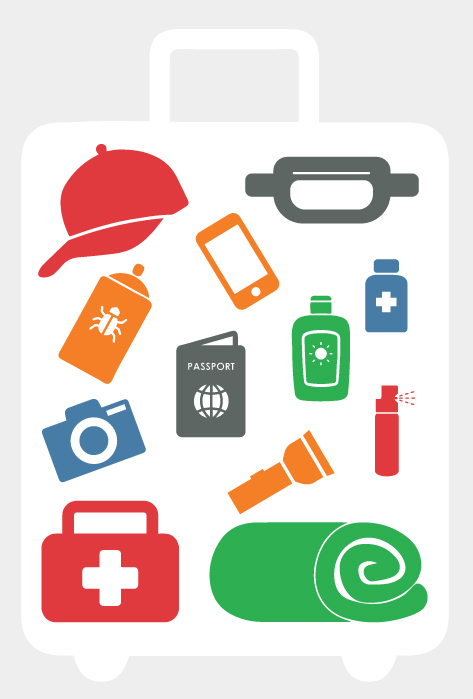 You'd be crackers not to pack medical cover for your trip! We cannot emphase enough the importance of packing light for your gap year getaway. You may want to pack the kitchen sink...but remember you're the one who's got to lug it around from A-B. Whether you've decided to backpack around Asia, live like a local in London or help build a school in Africa it's vital to get organised before your trip. With visas to organise, vaccinations to get, itineraries to plan and travel arrangements to book, we'd forgive you for being a tad overwhelmed. The following useful links will help make some take some of the stress out of the prepping.